Whether for Chanukah, a birthday or special occasion, Shabbat Shalom from the Hebrew Home is a perfect addition to your music library. For music lovers of all ages, this recording includes upbeat traditional Hebrew, Yiddish, and English songs and prayers, beautiful vocal harmonies and lively instrumental arrangements. 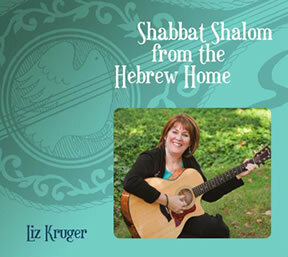 This album was recorded in 2009 in honor of the 100th Anniversary of the Hebrew Home of Greater Washington and Liz Kruger's 25th year as their musician-in residence. The songs follow the order of the weekly Oneg Shabbat programs. The CD can be purchased here or from iTunes, CD-Baby or Amazon. See the album content and listen to song samples here.